Please check back as we will make final additions to our schedule in coming weeks! "Super Team Dynamics: It's Time to Save the Day!" In a world where the workload is high and timelines are short, teams are often expected to accomplish goals that require superhuman abilities. While Business Analysts are frequently known for saving the day, success often hinges on the collective powers of a strong team. When you think of everyone you work with on a day to day basis, how do they operate as a team, or set of teams? Are they swooping in to save the day, or are they in need of rescue themselves? This session will demonstrate the importance of empathy, inclusiveness, healthy conflict and open communications, and why effective team dynamics is a crucial factor for success. We will discuss techniques from the latest research in team dynamics and human interaction so that you can apply them to your day to day work. Whether you are bringing your team along or attending on your own, this session will provide key activities that will help you be the hero your team needs as you all become a super-powered team! "Unicorns in the Forest: How to leverage your unique skills in the workplace"
Business Analytics hold a myriad of unique skills and techniques that may be as rare as unicorns in your kingdom. Whether these are skills you bring from a previous role or newly-acquired skills you've gained from an IIBA chapter conference, it is sometimes challenging to apply those skills within your kingdom. When your royalty and subjects don't believe in unicorns, how can you help them understand that they not only exist in the forests of other kingdoms, but that they can actually thrive in yours? This session will provide approaches that you can use to apply your unicorn skills in a way that demonstrates value and delivers results for your kingdom. Then, you will prove to your royalty and subjects that unicorns DO exist, AND they are amazing! "Thinking Big: Ethics Meets Analytics"
Big data is ubiquitous, and has surprising and outsized effects at the micro level. This session presents case studies, guidance on evaluating data and algorithms, and pointers for ensuring that models and algorithms are used responsibly. "People-Focused Storytelling - Putting the People back into your Process and Technology"
Do you ever start working on a project, and find the conversation keeps driving down a technical path? How do you bring it back and center both your business and IT partners on the real story? In this session, Josh will go over an outline of how to keep the focus on People, and ensure they are the most important part of People, Process, and Technology. Weaving in Design Thinking and a startup mentality can create the focused storytelling needed to win over executives and frontline employees with how your project will make a difference. What OneAmerica is doing to drive Innovation, and how one could Innovate in their day to day with 3 - 4 tools, activities, or strategies. "How do I get Adopted? - A Case for Sponsorship of Women and Minorities in Corporate America"
This workshop is for anyone learning how to navigate the rough terrain of Corporate America. Define sponsor, mentor and create your own personal Board of Directors. 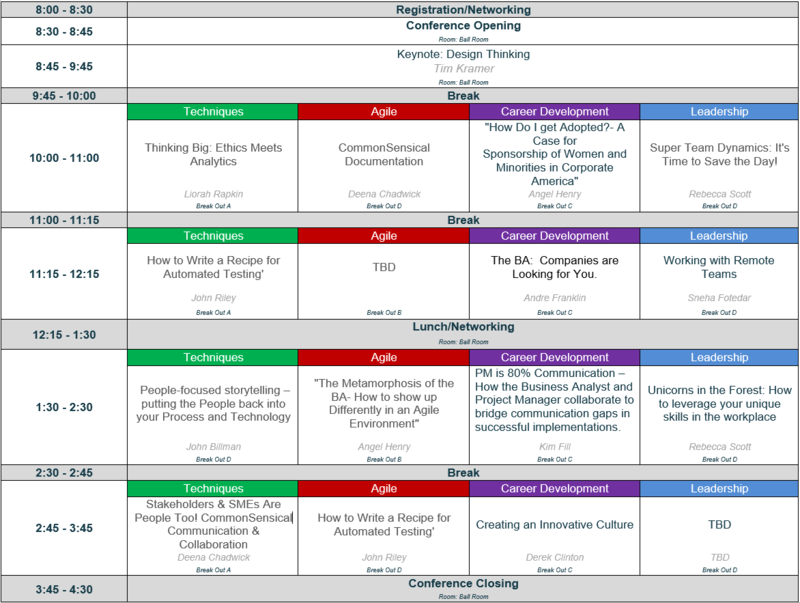 "The Metamorphosis of the BA - How to Show Up Differently in an Agile Environment"
This workshop is for a traditional BA learning to transition into an Agile environment and needing to demonstrate Agile principles and values quickly. Is there a place for BAs in Agile? Where do I start? What do I need to think or do differently? How do I show up differently at work? Most importantly, how do I add value? All these questions and more will be answered! In today's age of globalization, organizations and their teams are stretched across geographical locations. We all are a part of global market which works on collaborations across countries and borders. All thanks to technology as it has enabled us to collaborate, supervise and work with people/teams at different geographical locations. Geographical diversity is not just a requirement but a necessity and while working with remote staff has several advantages, manging it can be equally challenging. This presentation will define the concept of Remote Teams or Virtual Teams and how we can successfully build a team of remote staff and successfully manage them. "How to Write a Recipe for Automated Testing"
As Agilists, we strive to achieve Business Agility by reducing volatility, uncertainty, complexity and ambiquity. This task can be overwhelming in a world that demands continuous delivery of quality products. Using automated testing techniques is one engineering practice we can use to help us continually drive that quality, however, introducing new tools and techniques can further complicate our delivery. So how can we achieve Business Agility, automate our delivery, and set ourselves up for success? Believe it or not, it all starts with a well-refined user story. This talk will show you simple techniques we can use as business analysts to write awesome, structured user stories that will become the basis for our automated tests. The techniques include developing a common language and taxonomy that will reduce the VUCA, but also streamline our process, set our team up for a test-first mindset, and give us many other bonuses. "The BA: Companies are Looking for You"
"Use Case 2.0 Slicing: Making a Case That User Stories Just Don't Make the Cut on Large, Complex Agile Developments"
"Since [we] added the use case slice construct in Use Case 2.0, use cases now include everything that you get from user stories but offer a better way of understanding your whole system" says Ivar Jacobson who formally introduced use cases in his 1992 book, Object-Oriented Software Engineering - a Use Case - Driven Approach. Join me for a session on this scalable agile practice for capturing requirements and let me know if you agree.